On the 23rd of July 1892 a child was born to Ras Makonnen and Wayzaro Yashimabet of the Ethiopian province of Harar. His father was a mighty ambassador and cousin of the Ethiopian Emperor Menelik II. The child was named Tafari Makonnen and his birth was the fulfillment of the prophecy being a direct descendant of the ancient line of David and Solomon and Queen Makeda of Ethiopia. From his earliest days as a youth, the young Tafari showed and displayed knowledge far beyond his tender years. All who came in contact with him marvelled at his excellence in judgment. His knowledge and insight was such that from an early age he was instrumental in the shaping of Ethiopian destiny bringing this ancient kingdom to embrace the modern world that had now emerged around her. Active as governor of his own city of Harar when he was only 19, the young Ras Tafari continued to rise and in 1916 was subsequently made Prince Regent and heir to the Throne of Ethiopia with Empress Zauditu, daughter of Emperor Menelik II, as head of state. At the age of 38 Ras Tafari ascended the throne of Ethiopia becoming Emperor Haile Selassie I, meaning Power of the Holy Trinity, and the 225th Emperor of Ethiopia directly from the Solomonic line of Kings. 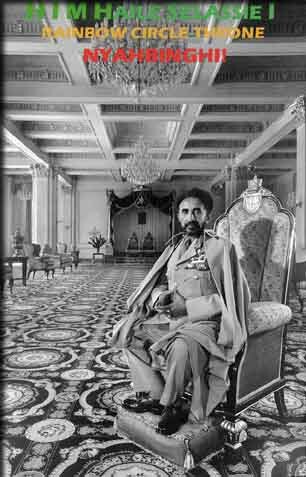 He also received the titles of King of Kings, Elect of God, Conquering Lion of the Tribe of Judah, and Light of the World. His Imperial Majesty is the victor over Italian Fascism in 1941 and his works in championing the cause of African Brotherhood has made him the father figure of African Unity. His Imperial Majesty is internationally acclaimed as one of the greatest world statesmen of the twentieth century and his works for the integrity of mankind, equal rights and justice are unparalleled. He alone is the uniting force for the millions of Africans taken away into slavery and scattered in the four corners of the earth and from the time of His Coronation, He was observed to be the returned Messiah by those who now bear his name RASTAFARI. I and I of the Rastafari faith observe Emperor Haile Selassie I in his full glory as the Almighty on earth in the flesh of Man. And herein, the Order of the Nyahbinghi is the Ivine Priestly Order, It was originated by and originally used by Melchisedek the High Priest and King of Righteousness. And was resurgent in these ages by the Rastafari brethren who are the blessed children of the King of Righteousness. The Order of the Nyahbinghi carrries the instrument of Justice and Judgment. The Judgment of the Order of the Nyahbinghi is to liquidate and terminate all evil conceptions. The justice thereof for the just is to guide and call ones ways and steps in the road which leads to the cities of ever livin life. The justice also for the unjust is, death to downpressors. And herein, the Theocracy Reign is a righteous government, and is administered thru Ivine principles. All its instruments of authority are in holiness. The Theocracy Reign do not affiliate with the governments and the churches of this world. The Theocracy Reign do affiliate with an Order. This Order is called the Order of the Nyahbinghi, which is the Order of Melchisedek. For this man Melchisedek is without beginning of days or ending of life. He abideth an high priest forever. Even so, I and I His sons and daughters live within the principles of ever livin' life.